My friend wanted to spend his last evening in NYC dining at Victor’s Cafe, a famous Cuban restaurant in Midtown. If I had been there becore it wouldve been 20 years or more ago. I enjoy some Cuban food – I’m talking to you, picadillo – but this is the first time in recent memory I’ve gone for an upscale, sit down Cuban meal. 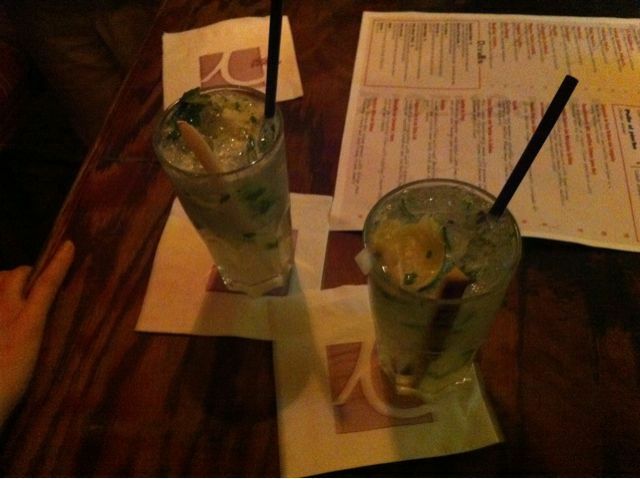 We started with the famed mojito. Victor’s is known for them. At the bar, I thought the mojito was very sweet – like jarritos. The slim, sliver of fresh sugar cane was excellent. This may seem like a no-brainer, but for some odd reason, I found the second mojito, served at the table, to be better – more tart. Also the sprig of mint that adorned it was crisper. Lobster empanadas at Victor's Cafe. We moved on next to the recommeded lobster empanadas. The crust was great, nice and crunchy, however the lobster inside it was less-than-stellar (then again, I am still adrift in the memory of the delicious Hot Lob). 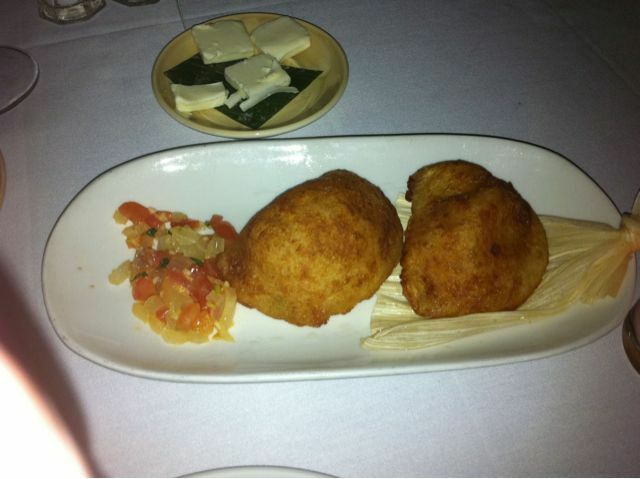 The cheese of the empanada, combined with the lobster, creates a very rich flavor. Overall, the empanada is tilted a bit more towards the cheese than the crustacean. We also sampled the croquetas, which are widely praised. They are pinky-finger length, crunchy, and delightful, tasting like a blend of sweet rich ham and cheese. The sangria service was impressive – our waiter managed to balance his tray of four stemmed glasses, tilting the pitcher into each one, without spilling, or toppling the whole thing. It made me a bit nervous just watching him – I certainly couldn’t manage such a feat of coordination. The sangria, much like everything else we had tried, was on the sweet side, with slices of orange and more than a hint of apple flavor. Ropa Vieja at Victor's Cafe. 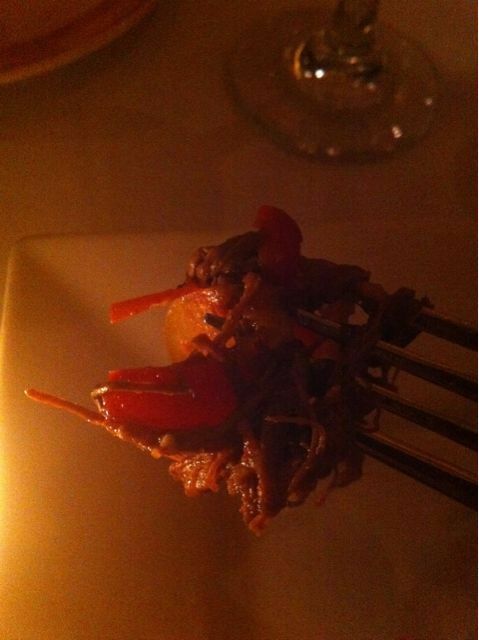 The sweet flavor train continued rolling along into the main course, the ropa vieja. This time that sweet note was brought in by the red pepper. I found the mashed plantains sitting underneath the fried tortilla the beef was served in to be particularly tasty. The flan at Victor's Cafe. 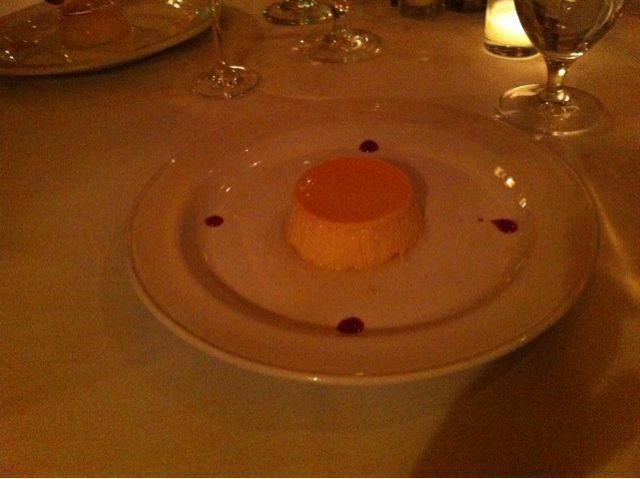 The flan stole the show, with its faint honey coating. The flan itself was thicker than most, as well as richer, heavier. More like a french vanilla flavor, with maple. The most interesting thing about the meal was what happened afterward. Everyone came out feeling leaden and in desperate need of immediate sleep. I think it must have been a combination of all the hooch, with the main culprit being whatever it is they use to make all the dishes so sweet. It felt like a massive sugar crash. All in all, tasty, and pleasant, but I’m not sure I’ll be back any time too soon. It’s too heavy, and a bit too sweet.